It’s not that frequently we see romantic comedies touching upon serious issues that's otherwise considered to be killjoy elements of rom-com genre. But since the characters here are rooted in reality, the director & writers effectively juggle between comedy and pathos, interleaving the intricately patterned narrative with messy, awkward, uncommunicative, and purely genial human expressions. When we sit down with friends or family for a meal we are expected to keep things pleasant and lighthearted. Since most of us don’t have to worry about the uncertainty of having the next meal, we focus our energy on laying out the unspoken rules on what can or cannot be discussed at the dining table. Hollywood’s idea of rom-com genre is pretty much like this obligatorily polite dinner table conversation. The directors of the genre usually deal with sillier excesses of romance and comedy with no emotional investment whatsoever. We remain as wry spectators, wondering will there be at least one honest, real, and universal expression amidst the barrage of cliches. Over the past few years, however, there has been considerable change in the way rom-com screenwriters incorporate a broader vision of human experience rather than just vaguely tick off outdated tropes of the genre. There’s an interesting range of low-key romantic comedies like Ruby Sparks, Short Term 12, Don’t Think Twice, etc which doesn’t shy away from emotional complexity or the messy parts of love and relationship. Most importantly, these tales possess truthfulness and a universal quality that bridges over our hearts, irrespective of cultural or social differences. Michael Showalter’s The Big Sick (2017) is the latest addition to the growing list of mature rom-com which not only expands the film-making grammar of the genre, but also turns us into an enthusiastic participant. American comedian Michael Showalter is best known in movies for his writing collaboration with David Wain to churn out the absurdist comedy Wet Hot American Summer (2001). The cult status of the movie recently led to production of Netflix original series. Showalter’s two directorial ventures – The Baxter and Hello, My Name is Doris — are less parody and more of a quirky dramedy with ingenious performances. With his third film as director, Showalter has gone through a more proficient transition. He adroitly adds more layers to the elements of comedy and romance that it remains entertaining without sacrificing the earnestness of the situation. The Big Sick is the nearly autobiographical tale of scriptwriters Kumail Nanjiani and Emily V. Gordon. Kumail is a stand-up comedian and star of Silicon Valley TV series. Emily is a couples and family therapist, writer, podcast host, and executive producer of weekly live comedy shows. Their romance commenced with cute courtship phase and suddenly turned harrowing due to Emily’s unfathomable, grievous illness. 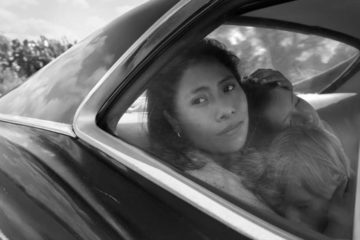 Of course, we are bestowed with a clear idea of what happens in the end, but this is a slightly meandering yet deeply felt tale that walks between mirthfulness and heartbreak. Pakistani-born Kumail Nanjiani plays himself and the narrative begins when he was burdened with anxiety in both personal and professional life. Kumail struggles to carve out his own space amidst fellow Chicago stand-up comedians. He drives Uber at night to make ends meet. The compulsory dinner routine with his Pakistani parents (Anupham Kher & Zenobia Shroff) at the suburbs is followed up with arrival of potential bride who just happen to ‘drop in’. The conservative parents believe Kumail will subscribe to the beliefs he grew up with and enter into an arranged marriage like his elder brother Naveed (Adeel Akhtar). They also hope Kumail will soon abandon the stand-up comic gig and pursue his law degree. But despite what he confirms to at family dinners and despite meeting up with stream of prospective brides (their head-shots preserved in a cigar-box), Kumail has no intention of living up to the dreams of his parents. After one rough night in the club, he meets Emily (Zoe Kazan), a grad student, and immediately hooks up with her. Their sparkling chemistry, however, propels them to take tentative step towards a romance relationship which unbeknown to Emily is threatened by Kumail’s caring yet imposing parents. For a while, the narrative seems to delve into familiar themes of culture clash and touch the broader aspects of inter-generational comedy. When Emily learns Kumail has told nothing about her to his parents, she leaves him in a fit of fury. Few weeks later, Kumail receives a call in the middle of night from Emily’s friend which potentially changes the dramatic terrain of the narrative. A mysterious illness puts Emily in a medically-induced coma and Kumail stays the night at the hospital after informing her parents — Beth (Holly Hunter) and Terry (Ray Romano). And as the parents arrive next morning, fully knowing about Kumail’s relationship with Emily, there’s a natural moment of awkwardness. Kumail keeps coming back to the hospital, relentless in his effort to provide some emotional assistance. What follows is Kumail’s off-kilter acquaintance with Beth and Terry. He deeply reconsiders his love for Emily and also ponders over lifestyle clashes and precariously poised professional career. Despite taking in such heavy and diverse topics, the vibrant comedy, rooted in truth, keeps on flowing. It’s not that frequently we see romantic comedies touching upon the ideas of serious illness, being Muslim in America, anguishes in long-term marriages, etc. These are considered to be drab, killjoy issues that are shunned from generic romance. But since the characters here are rooted in reality, the director & writers effectively juggle between comedy and pathos, interleaving the intricately patterned narrative with messy, awkward, uncommunicative, and purely genial human expressions. Of course, The Big Sick isn’t a perfect re-enactment of Kumail and Emily’s life journey. Both the couple’s script and Showalter’s aesthetics eschews journal entry-mode to go for the necessary cinematic effect. In reality, there wasn’t any hysterical argument like the one in movie when Emily learns about Kumail’s ‘cigar-box’ secrets. But to lend more dramatic weight to what’s coming next some manipulation is done. While Showalter elevates the dramatic quotient, he and the writing duo doesn’t forget to approach the character’s emotions with a clarity and authenticity. Characters, even ones in the periphery, are fleshed out with an inner-life and given ample space to grow emotionally. Take the character of a young girl to whom Kumail confides he is not interested in her and met up only because of his parents’ pressure; her annoyed & enraged reaction seems authentic and in the moment we could empathize for her rather than think that she is just a narrative device to incite Kumail over taking a firm life decision. The Pakistani parents are also not just used for goofy laughs or to assert their misguided sense of parenting. Their anger and fear over the son’s choice is dealt with enough understanding. With the central characters, the vivacity and genuineness of emotions go deeper, irrespective of the otherwise predictable narrative transitions. 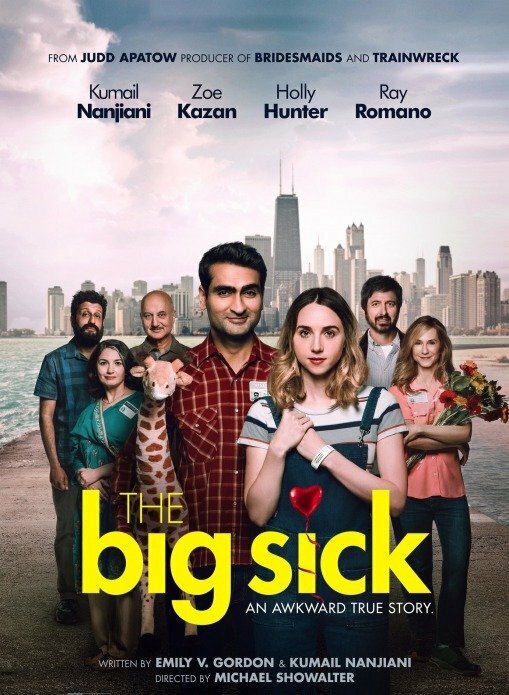 The Big Sick’s heavy lean on legitimate human feeling does lead to few rambling episodes whose absence could have cut short at least 15 minutes (producer and script consultant Judd Apatow’s works also face similar problems). The scenes set in the local comedy club and the comedians’ peculiar way of expressing their camaraderie grows little tired. Nevertheless, these are just minor flaws in a valuable rom-com that is willing enough to confront painful themes. The courtship between Emily and Kumail are different from hackneyed depictions of movie romance, but the narrative’s most distinct and golden scenes involve Kumail’s awkward encounters with Emily’s parents. Beth, the headstrong Southern woman hailing from military family, is the exact opposite of her docile New York husband Terry. Their misdirected rage, uncertainty, agitation over Emily’s illness, and burning long-time relationship issues are brilliantly conveyed. Emily’s intubation indirectly makes Kumail to probe on the vagaries of life: love, familial bonds, and death. And, Kumail’s contemplation attains more focus when it is set amidst the issues between Beth and Terry. Consequently, these day-to-day worries and tensions don’t just set the canvas for profound emotional exploration, but also diffuses flurry of interesting humor. On paper, it definitely sounds odd on how parents of protagonist’s comatose ex-girlfriend bond with each other. But such remote concerns are absolved by the director’s relaxed approach and truly magnificent performances. Holly Hunter’s spellbindingly intense performance is perfectly complimented by Ray Romano’s clumsy yet heartrending turn. The little, well-observed moments between them sheds refreshing light on long-term marriages. Director Showalter’s penchant for stimulating on-set improvisations brings certain memorable moments: for example, Ray Romano’s non-stop rambling on technology to suppress his emotional pains or Kumail’s unerring expressions during the break-up scene. While Kumail’s strength lies in dead-pan delivery of dialogues, his emotional shortcomings doesn’t sorely impact the tear-jerking scenarios. Zoe Kazan as usual excels in playing a live-wire character. What elevates her from other externally ‘beautiful’ actresses is the mixture of vulnerability, boldness, and frayed looks that envelopes her. The Big Sick (120 minutes) is yet another wonderful rom-com that proves romance and comedy in movies doesn’t need to distance itself far from emotional reality or complexity. Littered with enchanting performances and writing, this understatedly funny indie movie doesn’t shy away from dramatic heavy-lifting.